He worked in the PWD of the erstwhile Madras Presidency that included the present Tamlil Nadu and Andhra Pradesh. Even from a young age he was an avid reader and has deep interest in our religion. He read many Tamil and English books, particularly the classics. He spent a large part of his services in the Andhra region. He read the poems of vemana. Pothana’s Bhagavatam in Telugu greatly impressed him to the extent that it made him seek the original in Sanskrit. He learnt the language and studied the nook under scholars. He learnt the necessary supporting texts like the Upanishads, Gita, works of Sankaracharya, Vedanta Desika with qualified pundits. He studied the Tamil texts like Tirupugazh and Tirukkural and works of saint Tayumanavar and Ramana Maharshi. His deep knowledge of Vedanta enabled him to look deeper into the texts and detect subtle nuances of meaning that were not visible to an ordinary reader. His Job took him to a number of places in Tamil Nadu and Andhra regions. He hunted for books in the old book shops and libraries in these places. Since no copying facilities were available at that time, he laboriously copied the matter in note books. He was meticulous in whatever he had to do and lead a simple life. Many of the books he had copied are still not printed. As his studies continued he read the life of saints in other regions of India. He was impressed by Swami Ramdasa of Maharashtra. Later he was in Bombay with his sons. This provided him an opportunity to visit places associated with the saint and learn all about him. He was past 73 at that time. But his love for the Swami's works made him learn Marathi language and study the works of the Swami in original. 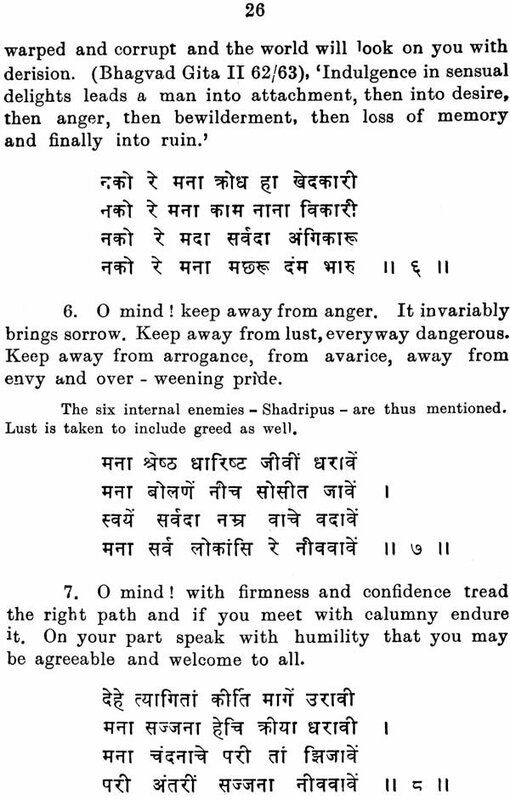 He wanted to translate all of the Swami's works into English with some commentary to enable many to enjoy his works. But age stood against undertaking such a venture. So, he first took up the short piece Atmarama. 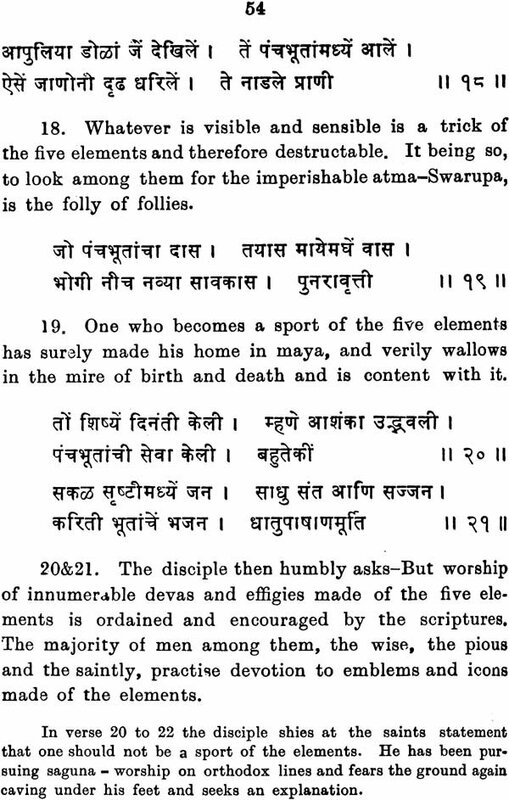 But some scholars suggested that he translate Swami's Manache Sloka also as this was easier to understand and can form a fitting introduction to Atmarama. He accepted this suggestion and, in spite of his declining health, he managed to translate that book also. His first acquaintance with religious books made him a staunch Advaitin. This is reflected in his work. The book was released in 1973. It was priced low so that it could reach many. It was distributed at the Samadhi of Swami Ramdasa at Sajjangad in Maharashtra State. Selections from this book have appeared in the Bhavan's Journal of the Bharatiya Vidya Bhavan, Bombay. 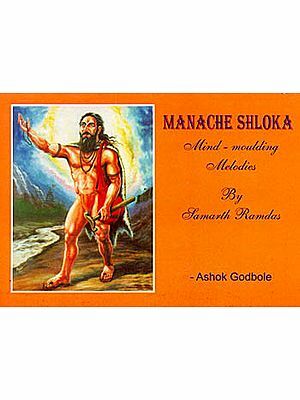 The Samskrita Academy, Madras is happy to bring out the reprint of the book "Manache Sloka and Atmarama" written in Marathi by Samartha Ramadasa and translated into English by Mr. P. Suryanarayana (P. Narayanaswami Iyer). The book was published in the year 1973 by the author himself and released at the Samadhi of Swami Ramadasa, at Sajjangad. Samartha Ramadasa was a well-known saint who lived in Maharashtra during the 16th century. He was a great devotee of Lord Rama and through his austere life; continuous devotion to Lord Rama became a realised person. His teachings are of great significance in the field of spiritual progress and attainment. 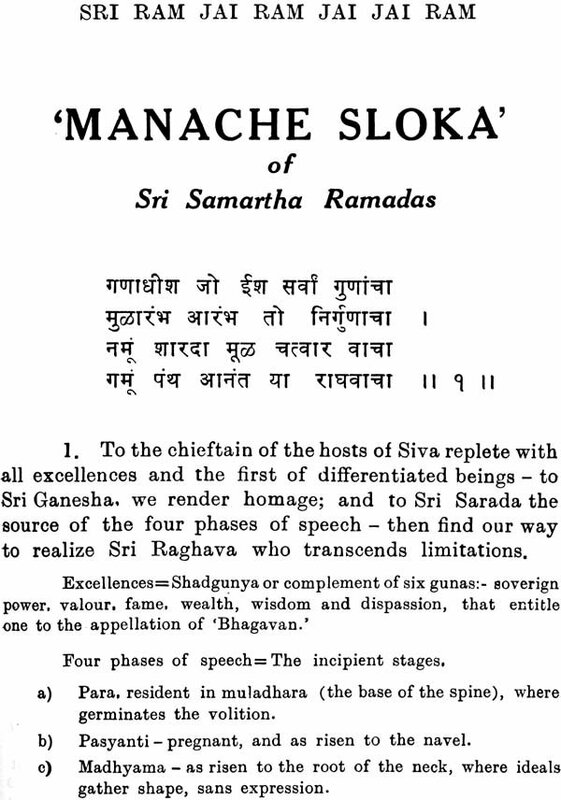 His two simple but valuable works, the Manache Sloka and the Atmarama were translated into English by Mr. Suryanarayana who by his hard work became familiar and highly proficient in not only his mother tongue but also in Sanskrit, Telugu and Marathi. 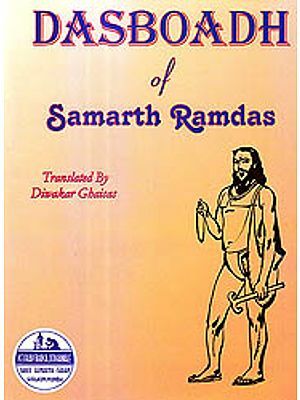 Being interested in the lives of saints he made a thorough study of those great saints of our Samartha Ramadasa. With his proficiency in Marathi, he was inspired to make the translation of the above two works of Samartha Ramadasa. The translation has been acclaimed as true to the original. The Academy feels that this translation should be reprinted again for the benefit of the reading public and for those specially interested in spiritual realisation. To enable the readers to know about the hard work done by Mr. Suryanarayana his life sketch is given on the back cover of the Book. The Academy IS extremely thankful to Mr. N. Balasubramanian for having come forward to extend financial support by meeting the cost of the publication of the reprint. Mr. N. Balasubramanian is an illustrious son of his illustrious father. This family trait of rendering service to Indian Heritage and Culture is upheld also by his daughter Smt. Sarada Bain of Scotland. The Printers M/s. Multi Craft, Chennai 600 028 are to be congratulated for the neat get-up of the reprint. Whenever there is a decline in righteousness and rise in unrighteousness, O Bharata then, I send forth my- self (G-IV-7). So declares Bhagavan to Arjuna. He means both the main Avatars and the subsidiary ones. For does He not himself define them? 'Whatever being there is with glory, grace and vigour, know that to have sprung from a fragment of my splendour (G-X-4l)'. He has mentioned Sankara, Marichi, Brihaspathi, Skanda, Bhrigu, Narada and Kapila for examples. Among the latter, passing over such as have appeared in the dim past, and coming to the day light of history, may be listed Samartha Ramadas of Maharashtra, Sri Ramakrishna of Bengal and Sri Ramana of the South. Sri Ramadas appeared at a time when the country was in the grip of Mahomedan oppression and religious Persecution; Sri Ramakrishna at a time when the high tide of scepticism and materialism fostered by western gales was sweeping the land of Sri Chaitanya; and Sri Ramana at a time when an epidemic of wayward atheism and contempt of Sanathana dharma was running among a section of the masses. All the three Saints strove in their life time, by the example of their lives and their utterances or writings to counteract those forces. Though each of them had a favourite approach to the Truth, all were shining examples of renunciation; all of them were easy of approach and all of them jivanmuktas. Ramakrishna and Ramana lived in times of peace, when communications were free and publicity was un- restricted. At the fullness of their fame, seekers came to them in large numbers and their teachings spread far and wide. They had adherents who faithfully recorded their sayings and doings. Ramadas lived in times of strife and uncertainty which paralyzed spiritual movement. His teachings in spite of their value and universal appeal never travelled beyond the domain of Mahratta language to which his writings were confined, and so they have remained to this day. 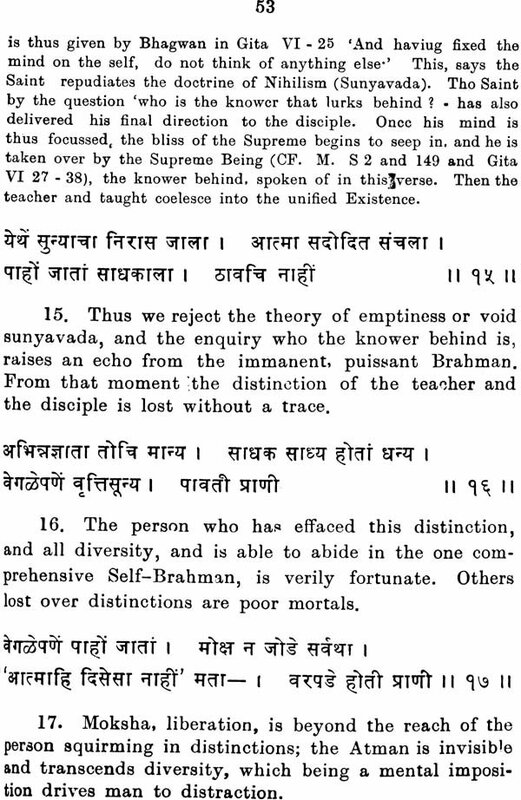 Ramakrishna says that there are two classes of sidhas-Nityasiddbas and Kripasiddhas. In the former their spiritual consciousness is awake since their very birth, and they assume human bodies only to teach others. In the Kripasiddhas the grace of God descends on them all of a sudden and they at once attain vision and knowledge. 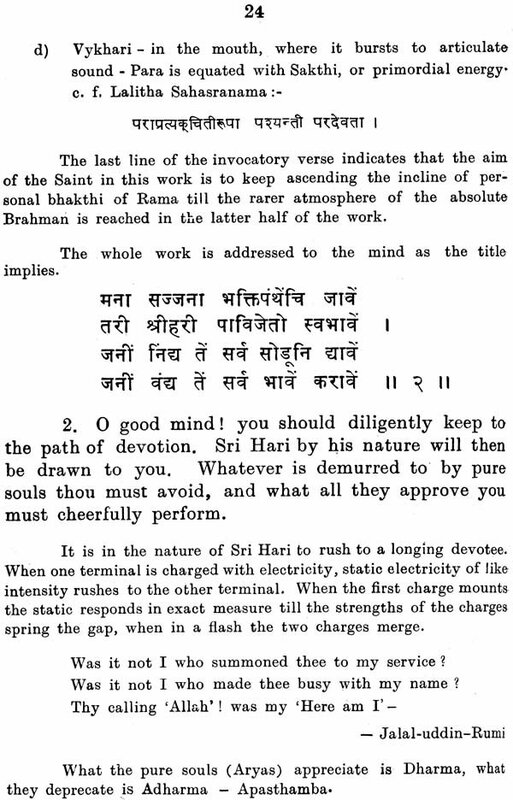 No better description of Ramakrishna and Ramana respectively can be given. 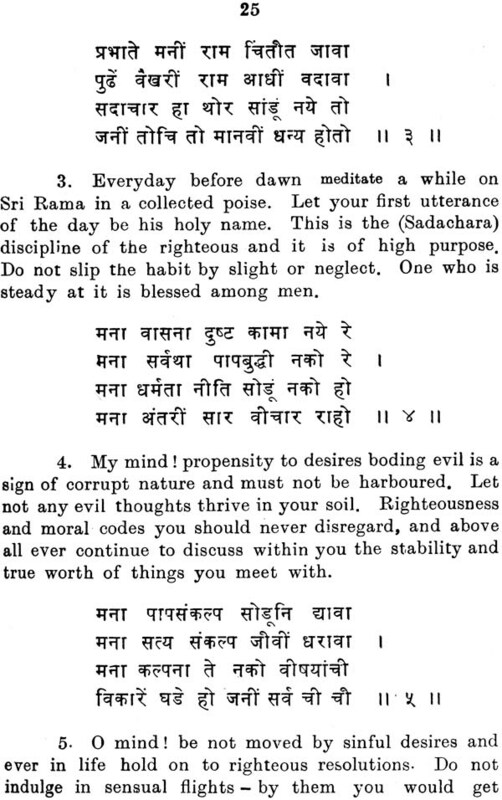 Ramakrishna also mentions a third class, 'sadhana siddhas', those who become perfect through self-discipline, and Ramadas belongs to this class. Rarnadas like the other two had no gifts from birth, except a resolute faith and a penchant for discipline. He worked his way up by his own efforts and steadfast application. He picked up his own religious education from the extant Maharatta literature, the writings of Jnanadeva, Nivrittinath, Eknath, Tukaram and others and the various Puranas and Gitas. He pursued his own Upasana till Sri Rama his chosen deity manifested Himself. Wedded as he was to the Advaitic doctrine, he still accepted the world, holding fast to the scriptural injunctions. He says 'I know no Sanskrit. By the grace of my Sadguru I can dispense with it. I can dispense with all kinds of learning. Subtler than all that is the instruction of my Guru. It is my vedanta, the secret of my heart. There is no reference to any kind of vedantic sanekr it works in all his writings. In the Dasabodha he says that he would use only Marathi to express himself so that it may benefit the populace. Following his own enlightenment, he thought and wrote with missionary zeal giving to Karma, Bhakti and Gnana their own place in spiritual life. His know- ledge of the world was vast. In his talks he insisted on the performance of Swadharma, on devotion to the personal God, on the need of ethical discipline, on the value of association with saintly persons, on the practice of discrimination and on the diligent pursuit of self-knowledge. He considered that a qualified Guru was essential to give the living touch to a spiritual awakening. In fact he evolved a routine or sampradaya, in which according to Bhagavata (XI-2-38) 'Even running with closed eyes one cannot fall down or stumble'. The records of the lives of Ramakrishna and Ramana and their utterances have all been before the public and are surely in the knowledge of such as may peruse this writing. In the case of Ramadas although he had a few close and intelligent disciples during his career, none of them have left us a connected account of the 45 years of his public life, nor a view of his personal dealings and sayings. A number of such incidents as are found published from time to time and of miracles attributed to him may be safely dismissed as apocryphal. He says 'miracles do not constitute spirituality and such stories are not true indications of spiritual greatness. Spiritual greatness lies only in the knowledge of the Self.' His life story has to be assembled from the surviving records of the several mutts and private papers as well as the records of his association with Shivaji. His written works are however, preserved and suffice to portray his eminence and his consideration for mankind. He is unreserved and ingenuous in conveying his thoughts to the readers. He is not chary of presenting his own accomplishments, be they in discipline, upasana or even his realization, as an incentive to them. He often tells us that he has practised the virtues he is preaching to others and that the ideal of life he places before them is one he has realized for himself. Says he' the end of my spiritual life has been attained. The purpose of my life has been fulfilled. The impersonal Brahman has been reached. All illusion has come to an end. The nature of the phenomenal world has been traced. What I had seen as in a dream has been dispelled in the state of spiritual wakefulness. The secret of spiritual life has been ineffable. The round of births and deaths has come to a close.' 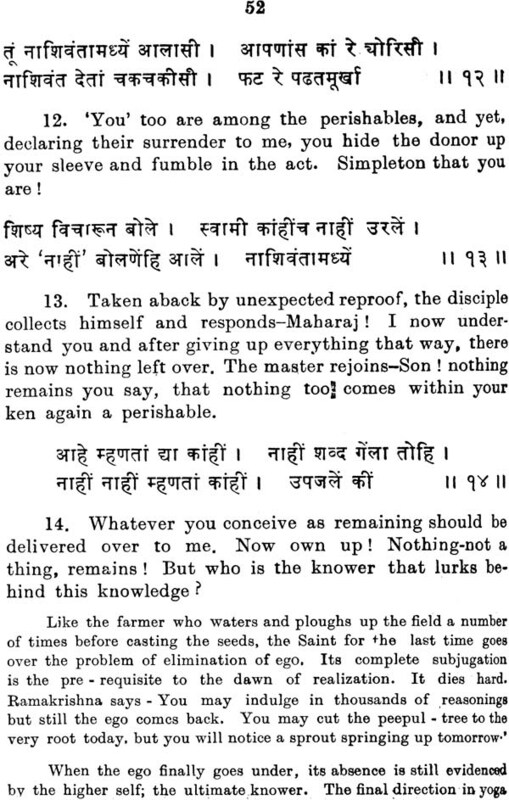 In verses 47-56 of 'Manache Sloka', he -gives a schedule of discipline he observed, which is indicative of his mastery over himself. Ramadas' association' with Shivaji which commenced when the latter was out of his teens and continued to grow on a master -disciple basis for over 30 years, and the advice constantly sought by Shivaji and tendered over his policies and ministration after he came to power and till his death, remain a very important episode in Maharatta history. It speaks to the close interest with which the saint as well as Shivaji followed the fortunes of the people and endeavoured to better their lot which was at that time deplorable. These are matter for their biography.